The Nurses Honor Guard pays tribute to nurses at the time of their death by performing the Nightingale Tribute at the funeral or memorial service. This service is similar to a military tribute and officially releases the nurse from their nursing duties. The Nurses Honor Guard dresses in the traditional white uniform complete with cap and cape. The ceremony is brief; it takes about 5 minutes, and consists of reciting the Nightingale Tribute and laying of a white rose on the casket or next to the urn, symbolizing the nurse’s dedication to the profession. After the Nightingale Tribute is recited, a triangle is rung after a roll call for the nurse. The nurse’s name is called three times and the triangle is rung after each call of the name. After the roll call the words are spoken that the nurse is officially released from their nursing duties. A lit Nightingale lamp is carried up at the beginning of the ceremony and is then extinguished and presented to the family with personal condolences made. It is not difficult or expensive to start a Nurses Honor Guard. The caps and lamps are available online and the capes are hand made with a simple pattern. Once you take the idea to nurses in your area, you form a volunteer list that you can call on. The larger the group the better, as not everyone would be available each time your services is needed. Retired nurses are also a valuable resource. Once you have a few meetings and get your caps and capes, you can make appointments with local funeral directors and let them know to offer this service to the family. It is helpful to provide them with a flyer to give to the family. Each nurse is responsible to purchase their own white uniform and shoes. If anyone would like assistance starting a Nurses Honor Guard, they can contact Julie Murray at jmurray@local459.org. Nursing is a calling, a lifestyle, a way of living. Nurses here today honor Name and his/her life as a nurse. Name, we honor you this day and give you a white rose to symbolize our honor and appreciation for being our colleague. 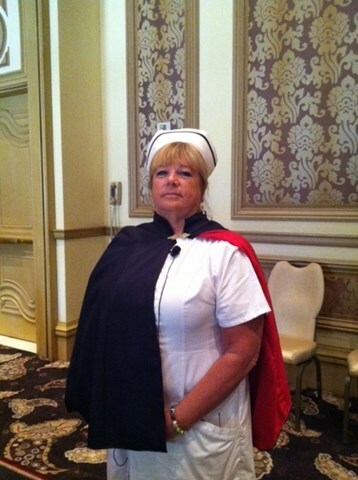 Nurse Honor Guard from Nursebuzz on Vimeo.